I think it perhaps necessary for me to state a few words in explanation of the liberty. I have taken in launching this unpretending volume upon the public. 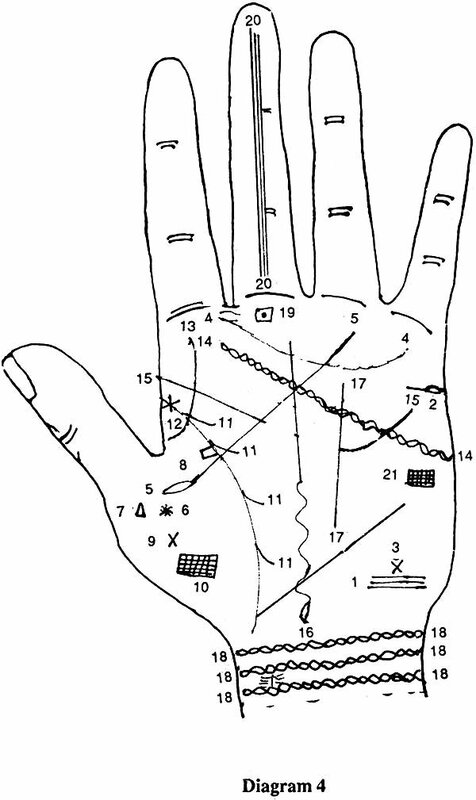 It is over twenty-five years that I have been engaged in the study of Astrology, Palmistry and other branches of occult philosophy. During this interval I have been carefully examining the hands of, I know not what number of individuals. 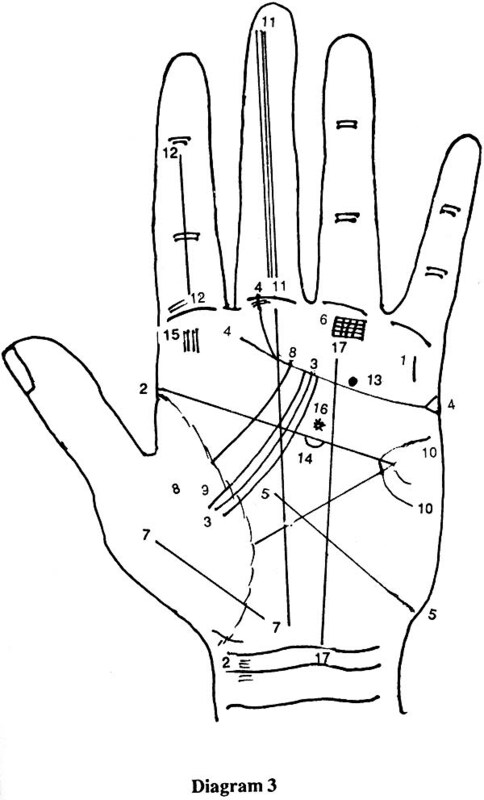 This study diligently pursued, enabled me soon to understand and interpret the significance of the lines and marks of the palms of the hands in relation to the events and incidents, present, past and future of L1.C lives of their posssessers. The present work is the outcome of that experience and study, supplemented by verbal instructions received from that illustrious adept whom it was my good fortune to meet with in my travels through certain parts of India in search of truth however occult, and to whom I am indeed materially indebted for the origin, plan and method of this work. 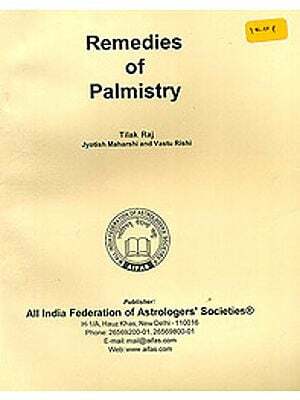 These verbal instructions have been given to me in the form of important hints and suggestions which are not to be found in any book on Palmistry written in English or so far as I am aware, in any other language. 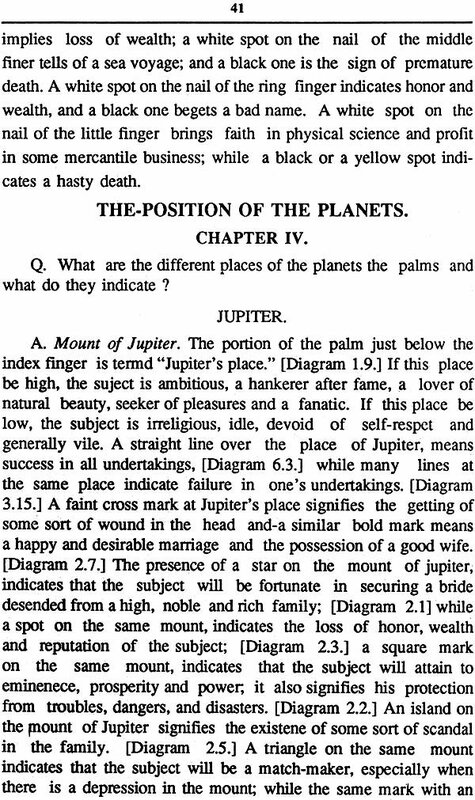 Thus the chapter on "Important Hints" in regard to explanation of the marks and spots of different colors to be found in the lines or mounts of the hands I owe wholly to his kind inspiration ; some of these hints form the subject of a special communication, which I had the honor of addressing to a periodical published in London under the title of "Palmist." Other hints of a like nature have been received from him which will be found embodied in different parts of this book. It would be superfluous for me to state all that I have learnt from him. Suffice it to say, that the gist of his instructions is that our destiny in life is unalterably fixed and determined beforehand. I fear I would provoke a smile of incredulity in the minds of readers who believe in the efficacy of human effort, If I were to state my conviction derived in the first instance from my venerable preceptor, and confirmed Subsquently by my practical experience gained during the last twenty five years that where a given sign or mark foreshadowing a certain event or condition of a mina's life, is found to exist in both of his hands, no exercise of skill, ingenuity, address or foresight, on his part would avail to obviate or prevent the occurence of that event. Whose eternal purposes embrace all accidents, converting them into good. That present work is not a rechauffe of any work written in English, though I must confess my obligation to the writers of the following treatises Ed. 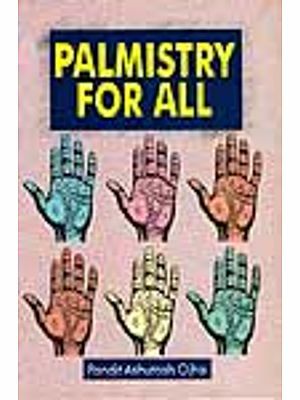 Heron Allen's "Science of the Hand" Chiromancy & C. Louise cotton's works on "Palmistry" M.J. Chapman's works on "Palmistry" Cheiro's Books on "Palmistry" Rasabaughaws "Influence of the Stars" for what information and assistance I could gather from English works on Palmistry. Several passages of this work will be found to be a pretty accurate rendering of portions of a Bengali Book I lately published under the title of "Samudrik siksha." I am aware of the many imperfections of my work, both as regards its form and matter; but I humbly hope that the indulgent reader will pass lightly over them. Finally I have to acknowledge with feelings of gratitude, the great services which have been rendered to me by Mr. N. N. Ghose, Barrister-at-law, and Editor. 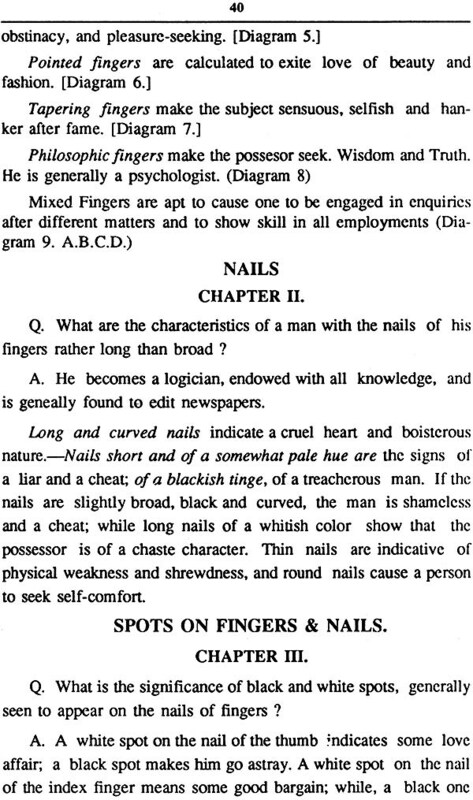 Indian Nation who has been kind enought to revise these pages before they passed through the press.